Work as part of a design team, where you'll develop your design aesthetic and visualization skills. 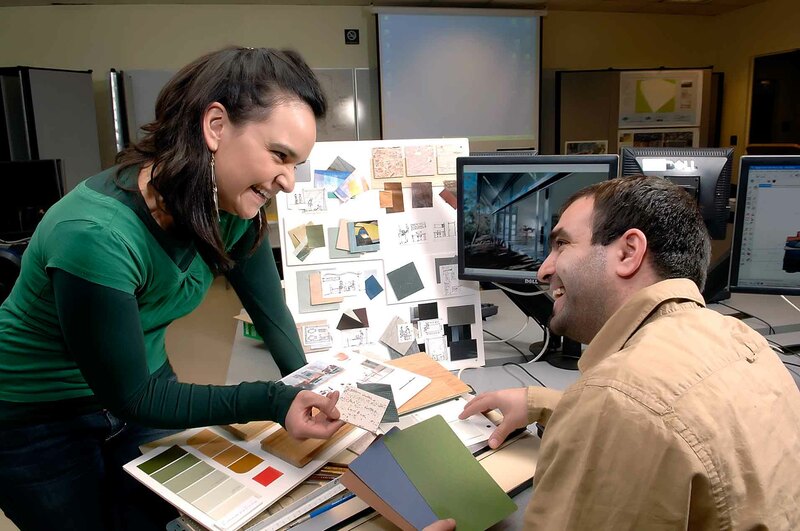 In the Interior Design program, you will learn how to plan a building layout; choose style and color palettes; select furniture, floor and window coverings; and determine lighting schemes for interior spaces. You will explore traditional and contemporary design styles; guidelines for using lighting and color; freehand, digital, technical and presentation drawing; design of space, color, texture; techniques for implementing clients’ wishes; legal and ethical considerations; and methods for communicating your ideas to clients and colleagues. The core courses you take together with Construction Management, Computer-Assisted Design, Facility Management and Architecture students will help you relate skills and specializations from various fields. Our experienced, supportive faculty will work with you to assemble a portfolio or website that showcases your abilities. This program leads to the Associate in Arts degree in Interior Design, with graduates prepared to transfer to baccalaureate institutions. However, after graduation from the Community College of Philadelphia, students may choose to enter the work force as junior or assistant designers, or as materials librarians. The following courses and sequence of courses is designed for the optimal success and completion of the Interior Design degree/certificate. Any alterations should be discussed with your academic advisor. Students must choose (2) of (7) Electives. Recommend choices should be based on intended transfer institution. Advising by ADC faculty recommended. ART 126 - Design II 3 credits Students must choose (2) of (7) Electives. Recommend choices should be based on intended transfer institution. * Students must complete ADC 101 and ADC 103 to meet the Technological Competency requirement. ** Students should select Mathematics and Science courses at CCP that correspond with the requirements of the institution to which they intend to transfer. New workers generally start around $31,675. Normal pay for Interior Designers is $45,744 per year, while highly experienced workers can earn as much as $64,233.